That’s the word that comes to mind during Steven Spielberg’s THE LOST WORLD JURASSIC PARK, the insipid followup to his mighty JURASSIC PARK (1993). Let it be known: JURASSIC PARK II was not made for its story (which departs from the book in the worst ways), nor for art, nor for fans, nor for enjoyment, purely for dirty profit. At the risk of sounding like Eric Cartman, dare we rename Spielberg’s sequel JEW-RASSIC PARK? So what are you waiting for, Steven – let’s see some dinosaurs. Still committed to some bare vestige of storytelling (maybe because David Koepp wrote the screenplay – sorry, ‘butchered’ is more appropriate), Spielberg gives us even more crammed exposition. There’s Schiff’s “high hide” (a useless piece of elevated cage that serves ABSOLUTELY NO PURPOSE); there’s Vaughn’s backstory about being in Greenpeace for the chicks; there’s Malcolm’s black daughter, Kelly (Vanessa Lee Chester), in whom we presume Malcolm’s white genes decided to skip a generation (even in trying to do the right thing – by showing us an interracial child – the filmmakers cast a kid as dark as the offspring of a Namibian princess and Barack Obama Sr.). Even throwing down his best Jeff Goldblum impressions, Jeff Goldblum still can’t stop this dino mound getting higher by the minute. By the time we actually reach the island, we’re trying to tunnel our way out. He actually uses my clinical definition of this fallback position for when ideas run dry: Running and Screaming. I oughta trademark that. A million trashy “horror” movies will owe me a big dime. The Corporate bad guys arrive on the heels of Malcolm’s research team, led by Great White Hunter Roland Tembo (Pete Postlethwaite – eternally 50) and slimy lawyer Arliss Howard. Lots of running dinosaurs. Capturing, mistreating, head-butting, ropes and jeeps and struggling corythosaurs. Oh my. Pete Postlethwaite’s energetic missing scene is indicative of this film’s problem: the theatrical release does not show Roland coming to the aid of a waitress at a tourist bar, knocking out a guy half his age with one hand tied behind his back. He does this not for honor, but because he’s bored. It is a great insight into his character. And the scene is cut. In favor of Running and Screaming. Doesn’t that tell anyone with a whit of knowledge on story construction where this film derailed? After he bags the tyrannosaur, Roland disappears from the script. Storyline so contrived, most of it is from JURASSIC PARK. Especially that “trailer-dangling-over-the-precipice” gag. Yawn. This overwrought sequence gives us yet another reason to dislike Mr. Spielberg, as innocuous Mr. Schiff tries valiantly to pull the dangling trailers up onto solid ground and is rewarded for his troubles by being eaten. Pulled apart by two tyrannosaurs! After all its cringeworthy humor and ratcheting tension, the movie pays off this supposedly thrilling sequence by killing the only likeable minor character. Now that was unnecessary. There is much science in Crichton’s didactic book; in the movie, the most science that occurs is watching Julianne Moore try to act. THE LOST WORLD JURASSIC PARK is centered around plopping a tyrannosaur in the middle of San Diego. Spielberg’s own confession. Which explains the half-baked, hurried and insubstantial dinosaur scenes on the island. More plagiarism, as the tyrannosaur arrives in Los Angeles like Dracula – aboard a ship with all the crew dead. The beast is still locked in the hold, which begs begs begs the question on how it ate everyone and managed to lock itself back in the hold. After Spielberg satiates his jones on stupid T. rex gags around Diego, it is captured by Goldblum and Moore and put back on the ship. Final scene is a stinker of the highest proportions, as a conga line of herbivores walks beside a conga line of carnivores as if neither can see the other. It is unbelievably incognizant. 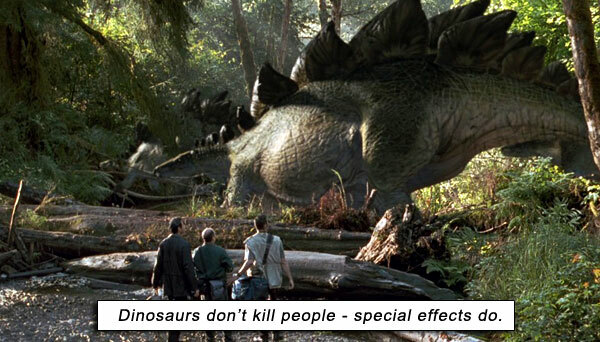 The only reason this movie scores at all is the “realism” of its dinos. They’re the best cybertronic and CGI animal whores that money can buy. aka: THE LOST WORLD JURASSIC PARK. aka: JURASSIC PARK 2, JP II. Writers: Michael Crichton, David Koepp. Starring: Jeff Goldblum, Richard Attenborough, Julianne Moore, Vince Vaughn, Pete Postlethwaite, Arliss Howard, Richard Schiff, Peter Stormare, Harvey Jason., Vanessa Lee Chester.